Download a copy of the manual as .pdf or .doc. When Pocket Stars starts up, it displays an overhead view of the sky. This is called the "2D Star Chart" mode. To select a single body or star simply click on the screen. A green square is drawn to highlight the selection, and live measurements of the calculated altitude (Hc) and azimuth (Az) are shown in the upper left corner along with the magnitude (M). To scroll the sky, just drag the selection. To zoom, use the plus and minus magnifiers or use the fast zoom slider at the lower right. The home button repositions the viewing point to directly over the users position, removing all pan and scroll effects. Select "3D Orrery" mode from the menu to view the entire solar system and background stars and constellations from any point in the solar system. In 3D mode, drag the screen to rotate the entire solar system. The zoom controls are used to set the viewing distance from the sun. You can switch between 3D and 2D views at any time - even when animating. Compass Indicates and changes which compass direction is shown at the top of the display. The yellow line indicates North. Click within the red circle and then drag the yellow line to point in the direction of North. Using this control, you can rotate the star chart 360°. Star Magnitude Use the Star Magnitude listbox to control how many stars are shown. When first getting oriented, select a low Magnitude number like 2 or 3. Zoom The ZoomIn and ZoomOut buttons let you control the magnification from 1.0 to infinity. Home The home button removes all scroll and panning effects. The stars shown in the green "X" at the center of the screen are directly overhead. Objects Displays a dialog controlling the objects to display on the star chart. Hint: Orbital Paths are compute intensive and will slightly decrease the speed of animation. By Month Selects the unit of time used for animation and stepping. Step - Step one increment of time forward or reverse. Animate Stop Continuously animate time forward or reverse or stop animation. Realtime Keep star chart synchronized with the device clock. Select... Select a particular time. If tap-and-hold on the star chart, a menu is displayed showing frequently used options which affect the chart presentation. Zoom - select from a number of common zoom settings. Horizon - select a horizon to view or zenith. Horizon.Flip East-West is used to mirror the star chart vertically, switching the position of East and West. When viewing the screen overhead, in line with the stars, leave this unchecked. When viewing the chart with the screen on a tabletop, check this item. Info... Show information about the selected object. Center - center the selected object on the screen. Full Screen - Remove the title bar at the top of the screen to increase the star chart real estate. Click the World Icon to activate the setup and Sight Reduction pages shown below. The LatLong Page establishes the central viewing point for the sky as well as the Assumed Position for sight reduction calculations using a sextant. There are four different ways to select your position. You can drag the cursor over the world map, select a country and then a city from the listboxes, enter your position in degrees, minutes, and seconds, or click on the GPS button to set your location via a GPS receiver. The first 4 entries in the city list are "Custom", user programmable locations which are retained across invocations of Pocket Stars. You can edit the text designation ("My Backyard") and set Lat/Long either via clicking on the map or manually entering the coordinates. The map also displays the position of the sun and portions of the world in daylight and night. The Time Page is used to set the Time Zone as well as two different time values. The time to use for the star chart. The time a moving vessel arrives at the Assumed Position set on the LatLong page. This value is only used for celestial navigation on a moving vessel. Time Zone contains three options for controlling the local offset from UTC (Coordinated Universal Time). System Clock - use the time zone specified by the device clock. This is controlled by "Start.Settings.System.Clock". Longitude - Uses the current geographical location (specified in the LatLong page) to calculate Zone Time. While correct for many locations, this method does not take into account the effect of political boundaries. Custom - Enables a list box to manually set the Time Zone. DST is a checkbox which specifies whether Daylight Savings Time is in effect. This control is only enabled for the Longitude and Custom methods of controlling the Time Zone. Realtime specifies that the clock in your Pocket PC is used to set the star chart time when checked. If this control is not checked, you can select a different particular time, and the star chart is static. as UTC specifies that the time fields are in Coordinated Universal Time rather than local time. Set arrival time at Assumed Position should be selected to specify the time when the vessel was at the location set on the LatLong page. This step is only important when calculating a celestial navigation fix on a moving vessel. The Environment Page describes the local environmental conditions of the observer. Although these settings will slightly modify the star chart display, they are mainly used when performing a celestial navigation fix. Vessel speed and Course describe the movement of the vessel. Height above sea level sets the observation height of the sextant. DIP Short horizon allows observations to be made when the true horizon is not visible. If you know the distance to a shoreline or other fixed body, check this box and enter the distance in nautical miles to the shoreline. Index correction specifies the required correction to zero the instrument error of the sextant in minutes of arc. Temperature and Pressure set the local conditions which affect atmospheric refraction. Use STP stands for "Use Standard Temperature and Pressure", which resets the Temperature and Pressure fields to their default values. Disable DIP, index, and refraction calcs (calculations) let's you input pre-corrected sextant altitude measurements. If checked, this also disables corrections for refraction on the Alt/Az position readout in the upper left corner of the main star chart. The Sextant Page is used to perform a celestial navigation sight reduction. 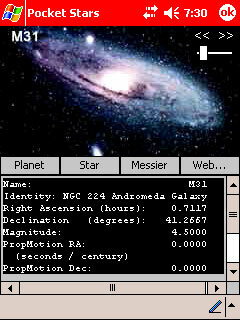 Here you can select a body or star for observation, and then input the altitude measured with a sextant (Hs). Body and Star fill the listbox with Bodies and Stars respectively. If you have selected a body in the star chart it will be displayed by default. Now sets the time fields to the current time. Last sets the time fields to the last calculated LOP. UTC when checked indicates that time values are in Coordinated Universal Time rather than local time. Altitude is where you enter the altitude to the body measured with a sextant. You can enter this as either decimal degrees, or as degrees and minutes. Calculate performs for the sight reduction for the given body, time, and sextant altitude. The result is shown in red in the lower left portion of the display as a distance toward or away from the Apparent Position along the Azimuth of the body. Save LOP saves the current LOP. Details displays all of the intermediate results for this LOP. Hint: Clicking on the red Altitude text fills the (Hs) edit box with the approximate calculated values for the selected body. This is just to make data entry easier. The Details Page shows all of the intermediate results used to perform a sight reduction and calculate a line of position. The LOPs (Line of Position) Page is used to calculate an improved fix from two or more LOPs. You can select from amongst the previously acquired observations by checking the associated checkbox. The standard deviation of the estimated position (sigma) is expressed in nautical miles. Generally, this value will decrease as the number of observations increases. Graph draws a graph of the selected LOPs along with the AP and FIX. Details shows the intermediate results for a particular LOP. Remove deletes the selected LOP. The example shown to the left is taken from the Nautical Almanac for the Year 2001 page 283. The Graph Page plots the lines of position enabled on the LOP page. The Apparent Position is centered on the screen (the blue square), and the various observations are plotted with the endpoints labeled with the measurement index (the red lines). The best fit to the measurements is plotted in green, and is labeled FIX. If a speed and course have been set on the Enviro page, the vessel course is shown as a dotted gray line passing through the fix. A 95% confidence ellipse is drawn centered on the FIX. The shape of the confidence ellipse depends only upon the number of observations and the distribution of the observations in azimuth. The size of the ellipse depends upon the observation errors. Hint: You can click on the graph to get the Latitude and Longitude of any point. Clicking near the endpoints of any observation displays the details of that observation at the bottom of the screen. All of the dialogs in this section are accessed from the View and Calculators menus. The Info Page shows additional information about the selected body. Tap-and-hold on the main star chart to display the Info page. Press the "Planet", "Star", or "Messier" buttons to display objects of each type. Hint: Use the slider control in the upper right corner of the screen to scroll rapidly through all of the bodies. Or use the << and >> arrows in the upper right corner of the screen to decrement and increment by one. The Rise Set Page show the rise, transit, and set times for all bodies. Select a date using the calendar at the top of the page, or use the << and >> arrows to move a single day forward or back. UTC switches the display between local time and UTC. The bottom line displays either "Standard Time" or "Daylight Saving Time" depending on the date selected. The Lunar Phase Page shows an animation of the phase of the moon for a month long period. Select a month to view by using the calendar at the top of the page. The graphic at the top of the page shows an animation of the relative positions of the moon, earth, and sun (obviously not to scale). If you click anywhere on the calendar, the animation stops and the lunar position is shown for that particular day. If you click outside the calendar, the animated display resumes. Note that in this month, the display shows a blue moon. The blue moon definition employed here is the "second full moon in a calendar month" version invented in March 1946 and foisted on an unsuspecting world by Sky and Telescope. For a fascinating look at the various definitions of blue moon, look here. The Great Circle Distance Page calculates the shortest distance between two points traveling over the surface of the earth along with the initial course from LatLong1 to LatLong2. Assumed Position loads either LatLong1 or LatLong2 with the current Assumed Position. Calculate performs the great circle distance calculation and initial course. You may select output units of NMi, statute miles, and kM. Earth Model specifies the shape of the earth used in the calculation. Spherical assumes a perfectly uniform, spherical earth where 1' = 1NMi. NAD83 (North American Datum of 1983) is an earth-centered datum based on the Geodetic Reference System of 1980. The size and shape of the earth was determined through measurements made by satellites and other electronic equipment; the measurements accurately represent the earth to within two meters. The Range and Bearing Page calculates resulting LatLong given a starting point, along with a range and bearing. Assumed Position loads LatLong Initial with the current Assumed Position. Distance may be expressed in either NMi, statute miles, or KM. Course is expressed in degrees true. Method allows selection of either "Rhumb line" (constant compass bearing) or "Great Circle" methods of computation. Both methods will give identical results for short distances and angles which are multiple of 90°. Calculate performs the range and bearing calculation. The Results window contains the resulting LatLong. The Horizon Distance Page calculates the visible horizon for both visible light and radar signals. Height of eye or radome specifies the eye height of the observer in either feet or meters. Calculate performs the horizon distance calculation. Hint: You can determine the distance at which an object of known height will be visible by adding the value to the height of the observers eye. Example: We're sailing to Tahiti, and wish to know how far away land can be detected. We know that Mount Orohena is 2241 meters high, and our eye height is 3 meters. Enter 2244 meters ( 2241 + 3), which gives the result of 98 NMi. Star chart Time format controls the format in which time is displayed in the upper right corner on the main star chart. Choices are "Local Time", "Local Sidereal Time", "UTC", and "Greenwich Mean Sidereal Time". Smart Zoom if enabled, automatically sets the star magnitude control on the menu bar as the chart is zoomed in and out to reduce screen clutter. Small Fonts uses a smaller font on portions of the star chart. Show Altitude/Azimuth (else RA/Dec) if enabled shows Altitude/Azimuth in the upper left corner of the star chart. Otherwise Right Ascension and Declination are displayed. Preferences.Colors is used to skin or customize all of the colors used to generate the 2D Star Chart and 3D Orrery display. Black/White/Red are choices in the first listbox which allows selection between three different color schemes. Each color scheme is independent from the others and can be individually customized. Default returns the selected color scheme back to the original settings after user confirmation. RGB enter the RGB (Red, Green, Blue) color components for the element (0-255). Choose Color displays a color selection dialog where a color may be selected for the element.